"Trying to replicate a dish from Williamsburg's King's Arms Tavern, I formulated this recipe out of several: my mom's pie crust, an old port wine sauce recipe, and, of all things, fajita filling. Great as the main dish for Thanksgiving or Christmas." Melt 1 tablespoon butter in a large saucepan over medium heat. Add shallot; cook and stir until softened, about 5 minutes. Add port and thyme; bring to a boil over high heat. Reduce heat to medium-low; cook until sauce is reduced to 1/2 cup, about 35 minutes. Bring chicken broth to a simmer in a small saucepan. Turn off heat and add half the mushroom slices. Let mushrooms soak, 15 to 20 minutes. Use a slotted spoon to transfer soaked mushrooms to a small bowl. Strain the chicken broth from the saucepan into a separate bowl, pouring it through a coffee filter or cheesecloth to remove any sediment. Dice the soaked mushrooms and transfer to the port sauce. Add the strained chicken-mushroom broth. Bring the sauce to a boil. Reduce heat to medium-low. Cook and stir until reduced to 1 1/2 cups, about 15 minutes. Mix cornstarch with 1/4 cup cold water in a bowl. Whisk cornstarch slurry rapidly into the simmering sauce until thickened, about 3 minutes. Add balsamic vinegar, salt, and pepper. Heat a skillet over medium-high heat. Saute beef until meat is still slightly pink in the center, 6 to 7 minutes. Transfer to a bowl. Saute remaining mushrooms and onion in the beef drippings until tender, about 5 minutes. Add to the bowl with the beef. Combine flour and salt in a bowl. Cut 2/3 cup plus 2 tablespoons butter into the flour using 2 knives or a pastry blender until mixture is crumbly. Add 1/4 cup plus 3 tablespoons cold water; mix until dough pulls away from edges of the bowl. Divide dough in half; set 1 portion aside and roll the other half onto a floured surface. 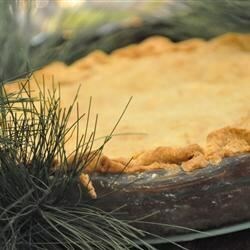 Press dough into a 10-inch pie pan to form the bottom crust. Spread the vegetable-beef mixture over the crust in the pie pan. Pour sauce on top, spreading to the edges. Roll out the other half of the dough and cover pie with the crust; seal the edges. Bake in the preheated oven until flaky and golden, about 45 minutes. Cool for 15 minutes. Steps 1 and 2 can be done at the same time. Use hard white flour if available.